Joan was a special guest on the day for the official re-launch of Esox Lucius II, one of three beautiful mahogany fishing boats commissioned by Ken Latham in the 1960s, and presented to the museum by Joan. Ken founded Broads retailer Lathams which celebrates its 50th anniversary this year. The Potter Heigham store is now owned by East Anglian group QD Stores who have contributed to the renovation by Museum volunteers of the classic boat. 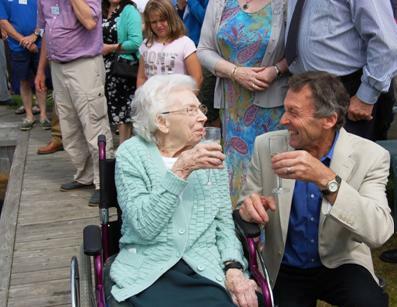 Having celebrated her 90th birthday just a few days previously, Joan christened the little boat in the time- honoured way - with champagne! Esox Lucius II forms part of a new display at the Museum telling the story of the relationship between it and Latham's, a byword on the Broads and associated with the newly-refurbished Museum since its inception. The launch coincided with one of the busiest days of the year for the Museum: the Grand Model Boat Display. "Everyone had a great day with a fabulous turnout of visitors as always", said Museum of The Broads' president and trustee, Robert Paul. "With the help of QD Stores we have been able to restore this beautiful boat which can now be used for hire to visitor wildlife and bird-watching trips. "It's a fitting tribute to the great Ken Latham and we were so glad Joan could be with us on the day."